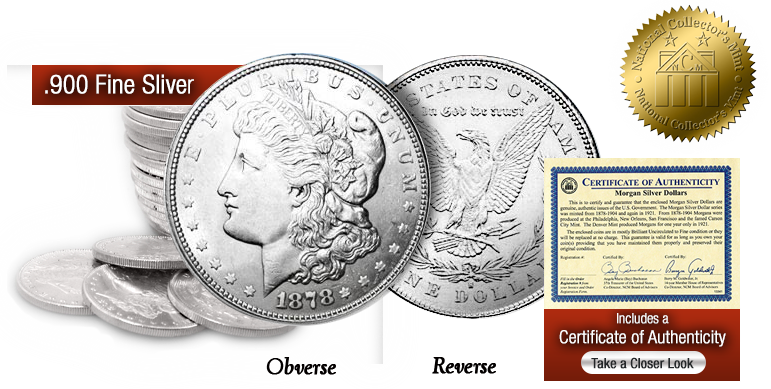 National Collector's Mint announces a special release of Morgan Silver Dollars 98 - 141 years old at $29.90 each. Several national dealers charge $45 - $70 MORE for a comparable Morgan Silver Dollar. These Morgans are among the last surviving originals still in existence, and each coin is guaranteed to be in Brilliant Uncirculated to Fine condition. There has been steady pressure for appreciation in the precious silver content of Morgans. Each Morgan Silver Dollar contains .77344 oz. of Pure Silver. Silver prices have jumped over 300% in the last fifteen years. That’s 40% faster than the Dow Jones average, even considering the recent record-breaking bull market. But purchases of silver coins and bars have risen even faster, with purchases climbing almost 400%. Increasing prices of precious metals and increasing demand for silver coins, make every Morgan Silver Dollar more valuable. 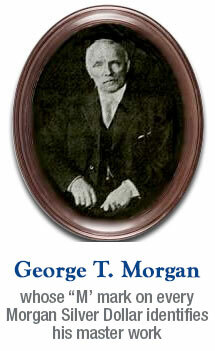 But owning your private cache of Morgan Silver Dollars is a long term investment in so much more... in history... in American heritage... in the splendid rendering of Miss Liberty’s profile by designer George T. Morgan, whose “M” mark on every Morgan Silver Dollar identifies his masterwork. 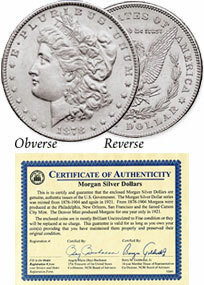 And, of course, Morgan Silver Dollars have not been minted for 98 years and are no longer in circulation. 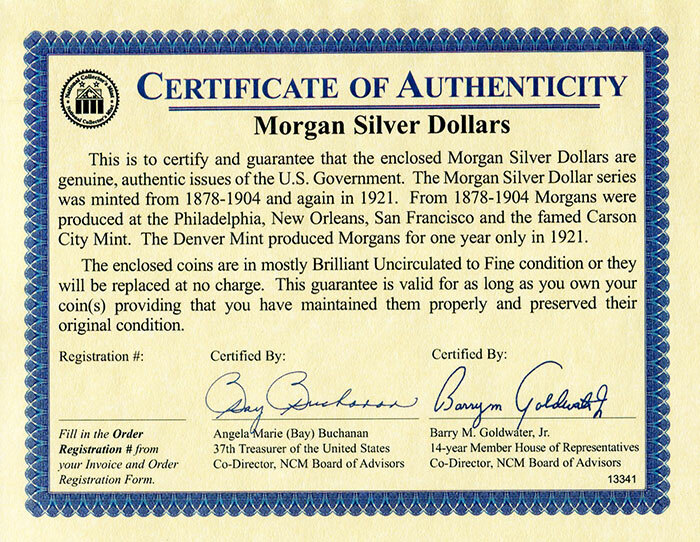 Now, 141 years after they were first minted, comes this special release of ORIGINAL U.S. GOV’T MORGAN SILVER DOLLARS... some of the last surviving “Morgans” still in existence in all the world. 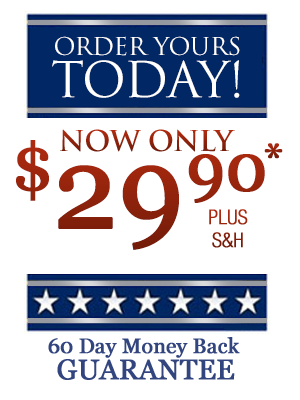 Our price of $29.90 each is guaranteed $45-$70 lower than several leading national retailers. We invite you to compare and check numismatic sources to see how prices may vary. We’re so confident of their current value and future potential, we make you this ironclad guarantee. 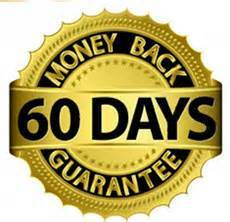 If you’re not 100% delighted with your purchase simply send us your postage paid return within 60 days for a refund of your purchase price. Avoid disappointment and future regret by staking your claim to these valuable treasures from America’s history immediately. ACT NOW! Silver prices have jumped over 300% in the last 15 years. 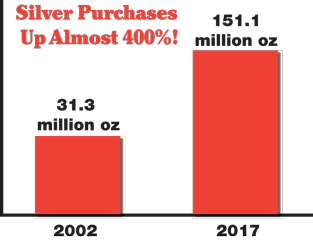 But purchases of silver coins and bars have risen even faster, with purchases climbing almost 400%! OFFER DETAILS: Purchase one Morgan Silver Dollar today for $29.90 + $4 shipping, handling, and insurance, 3 for $89.70 + $9 shipping, handling, and insurance, and 5 for $149.50 + $12 shipping, handling, and insurance.